Fin design is an art with over a hundred years of documented history. In this visual article we will take a look at some of the more out there ideas that never made it into mainstream consumption. Our first entry is also the earliest. 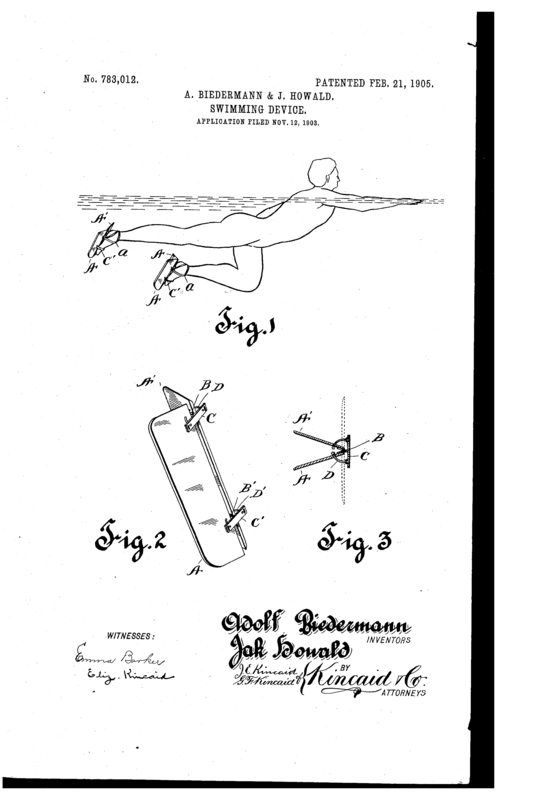 This patent, filed by Adolf Biedermann and Jak Howald, is from 1903. It is essentially a sandal with a collapsible flap designed to aid swimmers in all the strokes of swimming. The next unique design comes from Charles Drummond in 1967. He took the collapsible flaps to a whole new level. It seems very likely that the more complex these designs became, the less functional they would be in the Ocean. The Predator Defense Swim fin is the most aptly named and aggressive fin design we found. David Graves created this device so that swimmers could protect themselves from sharks. This might not be the best call for bodysurfers as we tend to get tossed around and would end up slicing our own Achilles tendons. 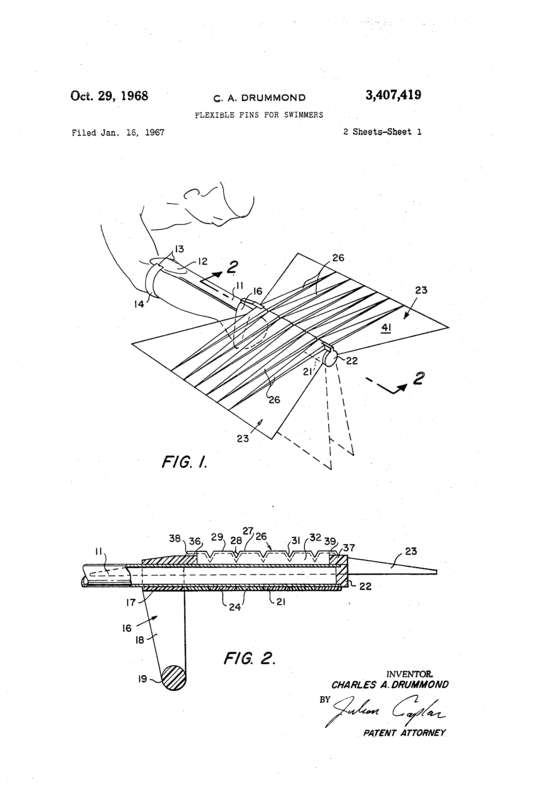 Above you see the patent art from the first motorized swim fin we found. 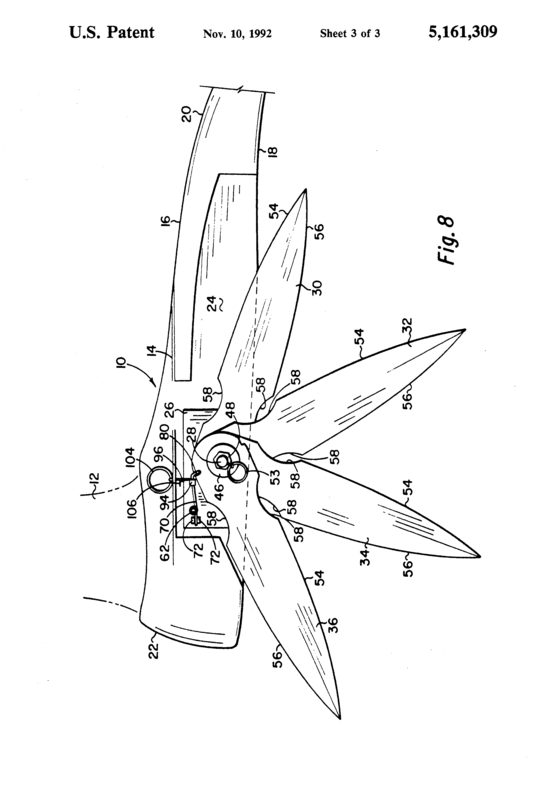 William Lalli Jr. designed these devices to blend modern propulsion devices with modern swim fin design. It is hard to imagine how much propulsion could be created, but it would be worth a fun time taking them for the test swim. Do you hate taking off your shoes to go for a swim? Frank Zakul has you covered. 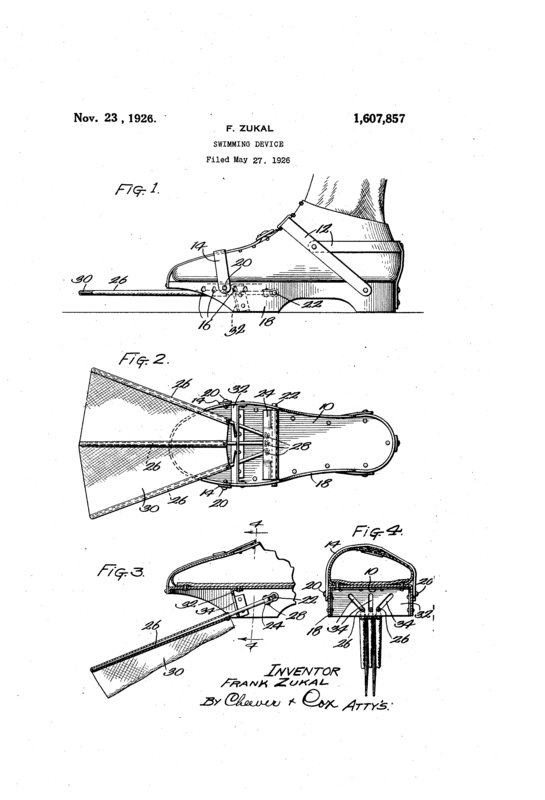 In 1926 he created the swim fin for shoe wearers. Like many other swim fins to be developed in the following years, the fin is designed to be collapsed on the upstroke and spread out on the down. I imagine the prototype of Zakul’s making to be covered in dust in the attic of one of his decedents just waiting for re-discovery.